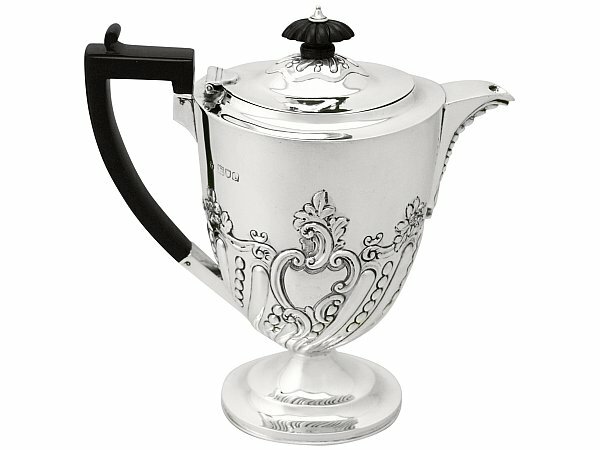 This fine antique Victorian sterling silver coffee jug has an oval rounded Queen Anne form onto an oval pedestal foot. The lower portion of this coffee jug is embellished with impressive embossed convex fluted and bead decoration in a swirl design, below a scroll and leaf decorated border. The decoration to the body incorporates a scroll bordered shaped cartouche to one side accented with elevated leaf designs. This antique silver coffee jug is fitted with a hinged domed cover, which also features embossed fluted and bead decoration encompassed by a plain undulating band. The cover retains the original carved oval fluted painted wood and sterling silver finial, securing to the interior with a wing nut. This fine coffee jug is fitted with the original plain angular painted wood handle with a scroll style thumbpiece. The impressive spout is ornamented with bead decoration to the underside and a scrolling design to the nadir. This impressive antique coffee jug was crafted by the renowned London silversmith Charles Stuart Harris. This antique sterling silver coffee jug is a very good gauge of silver, fine quality and in excellent presentation condition. The interior of the coffee jug has been professionally cleaned and is ready for use. Full hallmarks struck to the surface of the coffee jug and part hallmarks to the interior of the cover are very clear; the top portion of the maker's mark shows signs of wear in keeping with age and where struck. Reflections in photographs may detract from the true representation of this piece of Victorian teaware. Length from back of handle to tip of spout 21.1cm/8.3"
Height to top of finial 22.7cm/8.9"